Folklore is one of the earliest English-language journals in the field of folkloristics, first published as Folk-Lore Record in 1878. Folklore publishes ethnographical and analytical essays on vernacular culture worldwide, specializing in traditional language, narrative, music, song, dance, drama, foodways, medicine, arts and crafts, and popular religion and belief. It reviews current scholarship in a wide range of adjacent disciplines, including cultural studies, popular culture, cultural anthropology, ethnology, and social history. Folklore prides itself on its special mix of ethnography, analysis, and debate, formal and informal articles, reviews, review essays, and bibliographies. It encompasses both North American and European approaches to the study of folklore and covers not only the materials and processes of folklore, but also the history, methods, and theory of folkloristics. Folklore aims to be lively, informative, and accessible, whilst maintaining high standards of scholarship. All of the editors can be contacted via The Folklore Society’s contact page. Full editorial information is available on Taylor & Francis Online. 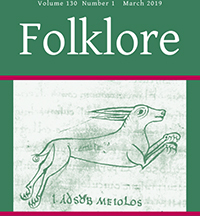 A personal subscription is available by becoming a member of The Folklore Society. See our membership pages for more information. Insititutional subscriptions are available through the the Folklore home page on Taylor & Francis Online. The full content of previous issues is also available on Taylor & Francis Online. Papers on any topics within our remit are welcome at any time; however we occasionally feature focus-issues on matters of special interest. View the Instructions for Authors.